(Nanowerk Spotlight) There is currently a very strong interest in using graphene for applications in optoelectronics. Graphene-based photodetectors have been realized before and graphene's suitability for high bandwidth photodetection has been demonstrated in a 10 GBit/s optical data link (see our previous Nanowerk Spotlight: "Graphene photodetectors for high-speed optical communications"). Photodetectors are electronic components that convert light into electrical signals and are for instance used as receivers in fiber optic networks where they return the light information to the form of an electric signal. Photodetectors are usually fabricated from semiconductors such as silicon or gallium arsenide. When photons strike a semiconductor they generate so-called electron-hole pairs which are then separated in an electrical field, which leads to an electrical current. This electrical field usually is generated by an external voltage applied to the component. By using graphene, researchers make use of the internal electric field that exists at the interface of graphene and metal. However, the low optical absorption of graphene – only 2.3 % due to its monoatomic thickness – leads to a low responsivity of these devices. Several groups worldwide are therefore currently pursuing different approaches to increase the interaction length of light with graphene and enhance the optical absorption. One novel approach, developed by scientists at Vienna University of Technology in Austria, is based on the integration of graphene into an optical microcavity. The increased electric field amplitude inside the cavity causes more energy to be absorbed, leading to a significant increase of the photoresponse. The team has presented their findings in the May 7, 2012 online edition of Nano Letters ("Microcavity-Integrated Graphene Photodetector"). "In our letter, we present the monolithic integration of graphene with other, more established materials and technologies to form a novel, highly complex optoelectronic device," Dr. Thomas Mueller, a researcher at TU Vienna's Photonics Institute, tells Nanowerk. "In particular, we integrated graphene into an optical microcavity. By doing this we were able to enhance the inherently low optical absorption of graphene by a factor of 26, achieving values >60%." Based on this technology, Mueller and his team present a graphene microcavity photodetector with strongly improved photoresponsivity. As operating wavelength they have chosen 850 nm, a wavelength that is often used in low-cost multi-mode fiber data links. Mueller points out that, due to the broad absorption range of graphene, this concept can be extended to any wavelength from the mid-infrared to the ultraviolet, provided that a low-loss optical cavity can be realized at the respective wavelength. Mueller explains that in their novel device, two distributed Bragg mirrors – consisting of quarter-wavelength thick layers of alternating materials with varying refractive indices – form a high-finesse planar cavity. "Bragg mirrors are ideal choices for microcavity optoelectronic devices because unlike with metal mirrors the reflectivity can be very well controlled and can reach values near unity," he says. 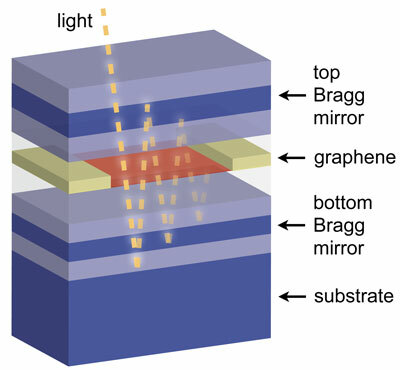 "The Bragg mirrors are made of large band gap materials that are nonabsorbing at the detection wavelength. The absorbing graphene layer is sandwiched between these mirrors. A buffer layer ensures that the maximum of the field amplitude occurs right at the position where the graphene sheet is placed." The high operating speed and the broad wavelength operation range of graphene photodetectors make these devices promising for a variety of applications in photonics, including optical communications, security, sensing and spectroscopy. The devices show a photoresponse only at the design wavelength, making them also promising for wavelength division multiplexing. Moreover, the above study extends beyond the realization and characterization of a photodetector. The researchers note that their approach can be applied to a variety of other graphene devices such as electro-absorption modulators, variable optical attenuators, and possibly also future graphene light emitters. Due to the broad absorption range of graphene, this concept can be extended to any wavelength from the far- and mid-infrared to the ultraviolet. Mueller says that the team plans to extend the operation wavelength of graphene photodetectors to larger wavelengths, i.e. into the far- and mid-infrared regimes. These spectral regions are technologically not very well developed and there is a strong demand for novel long-wavelength optoelectronic devices.